The discovery was made while a local resident was walking his dog along Van Cortlandt Park East and E 238th Street. 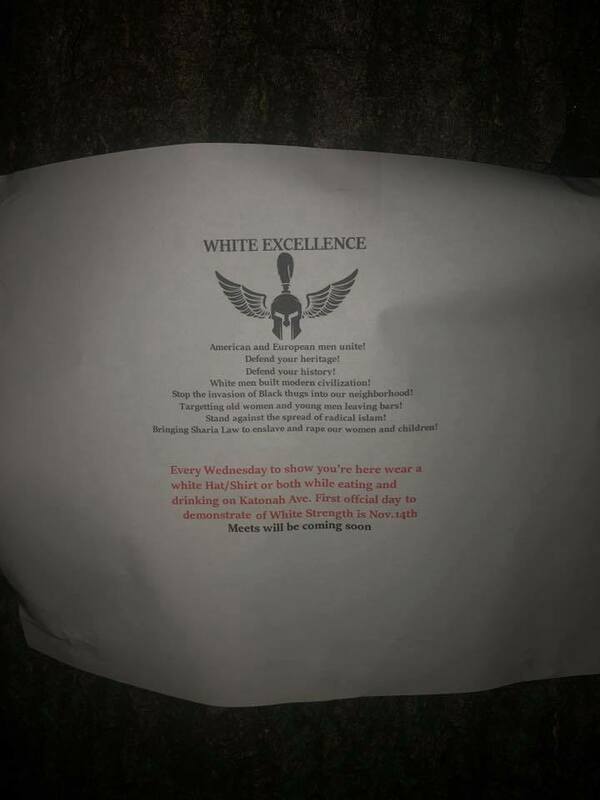 The flyer goes on to ask that men wear a white hat/shirt or both each Wednesday beginning November 14th while eating and drinking along Katonah Avenue to “demonstrate White Strength” against what it calls “an invasion of Black thugs into the neighborhood” and against Sharia Law and radical Islam. “When I moved here, I was aware that Woodlawn has historically had a racist side to it, but the neighborhood’s demographic has been changing for as long as I’ve lived here. There are more non-white residents of many races, and it’s been great to have them in our neighborhood. There are Indian doctors, African teachers, Philippinos, and many others represented in Woodlawn.” they added. Steve Nallen, 37, who’s a life-long resident of Woodlawn and whose family has been living in the neighborhood was surprised when he learned of the white supremacist call to action in his neighborhood. “…it’s a surprise. I believe it is most likely an act of an individual trying to stir the pot in the neighborhood. A troll. I do not believe there is a white supremacy group forming in Woodlawn. However, there may be a few people in the neighborhood that in general do not like change.” said Nallen. And Woodlawn has indeed been changing as census records indicate the white population of the neighborhood is declining and is currently at 46.7% as of 2016. During the 2000 census it was at 55%. Our anonymous tipster also shared this sentiment and said, “It is New York City. 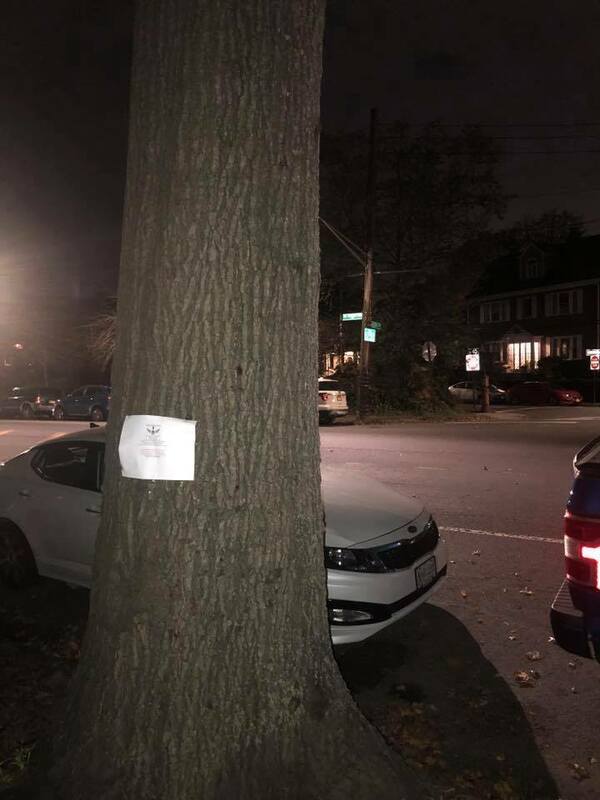 It’s scary that white supremacists feel emboldened to staple a recruitment flyer on a tree in Van Cortlandt Park. Most of Woodlawn residents do not support this mindset and will fight it. Fear of others based on race is not good in any way, and it’s not welcome in Woodlawn. The timing of the flyers doesn’t escape us as they went up the day after Democrats took control of the House of Representatives in the midterm elections where an historic number of over 100 women were elected including the first two Muslim women elected to Congress along with the first two Native American women elected to the same legislative body as well. Just yesterday the NYPD confirmed that hate crimes in the city are indeed on the rise. And it’s not just New York City but a nationwide trend as hate crimes are rising across the country. We, in The Bronx do not tolerate any kind of hate. Whether this is an act of a lone individual or a larger group will remain to be seen. Stay tuned as this is a developing story.